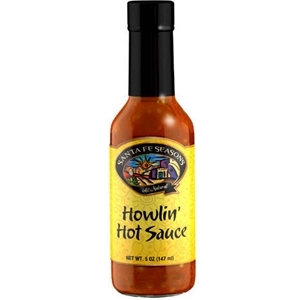 Santa Fe Seasons Howlin Hot Sauce is made with Scotch Bonnet peppers, red bell peppers, onion, garlic and sea salt that impart a fire and flavor of the Caribbean. Use it in jerk sauces and spice up a fruit salsa or embellish seafood. Impart the flavor and fire of the Scotch bonnet pepper to jerk sauces, curries, or any Caribbean dish. Use it to create your own wing sauce, spice up a fruit salsa, a grilling sauce or simply embellish eggs or seafood. 5oz. Scotch bonnet peppers, red bell peppers, water, vinegar, onion, garlic, sea salt, xanthum gum.